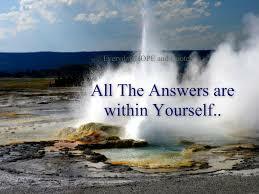 Home Enlivening You Have All The Answers! Our Spiritual journey is but a vast contrast to either the most deserted desert or a rain forest filled with everything alive and beautiful. Mistakes are made and frustration overwhelms, daily routines, duty, task and function become burdensome and what is left at the end of the day is confusion, ‘am I really meant to feel so unhappy’, you find yourself asking more often than not? When we are completely indulged in our Ego mind everything becomes a problem and nothing is made simple.